You are here: Home / Research & Publications / Research Archives / Commentary / COMMENTARY: WHERE TO WITH AFRICAN REGIONAL INTEGRATION? COMMENTARY: WHERE TO WITH AFRICAN REGIONAL INTEGRATION? The desirability and necessity of African economic integration is largely not in dispute. 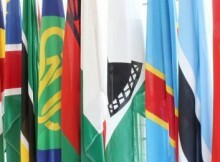 However, despite the support from African governments, progress in African regional economic integration has been slow. This commentary summarises discussions held at the recent Tralac Annual Conference 2016 with a theme “Towards Rules-based Governance in African Trade and Integration?”. https://www.namc.co.za/wp-content/uploads/2018/02/IMG_0457x_Nermark_crop-220x162.jpg 162 220 admin http://www.namc.co.za/wp-content/uploads/2017/08/logo.jpg admin2016-04-18 11:51:542018-02-14 12:03:11COMMENTARY: WHERE TO WITH AFRICAN REGIONAL INTEGRATION?